Today as I'm linking up with Amy at Love Made My Home for Five on Friday, I decided to share photos of five desserts I enjoyed this past summer. In truth these past few months I had more than my fair share of delicious desserts. Some were made in my own kitchen -- fruit cobblers, lemon loaves, gingersnaps, pineapple cake with vanilla sauce, ice cream with hot fudge and pecans -- while others were enjoyed elsewhere. While we were in BC, we had the fun of having lunch at Government House in Victoria, BC one afternoon after we toured a lovely garden. Warm and sunny out, there was an excitement in the air around the beautiful grounds as there was a big tea party going on to mark the day Queen Elizabeth II became Britain's longest-reigning monarch. The 89-year-old monarch surpassed her great-great-grandmother Queen Victoria, who ruled for 63 years and 216 days. Although we weren't part of that particular festivity, we enjoyed a pleasant lunch, after which hubby and I shared this delectable carrot cake topped with cream cheese icing and decorated with fresh fruit, including one round orange persimmon tucked under its parchment-like leaves. It all looked so pretty, we hated to dig in. But we bravely took forks in hand and slowly savoured every bite... without shame or guilt. Paired with a black Ceylon tea, the combo was tea party p-e-r-f-e-c-t. I suggest carrot cake, zucchini bread and pumpkin pie." "Don't wreck a sublime chocolate experience by feeling guilty." While we were in BC, we had the happy opportunity to celebrate a great-nephew's 12th birthday. His dad, being the head chef in a popular restaurant in Chilliwack, made us the most exquisite chocolate mousse cake I've ever had the privilege of sinking my teeth into. 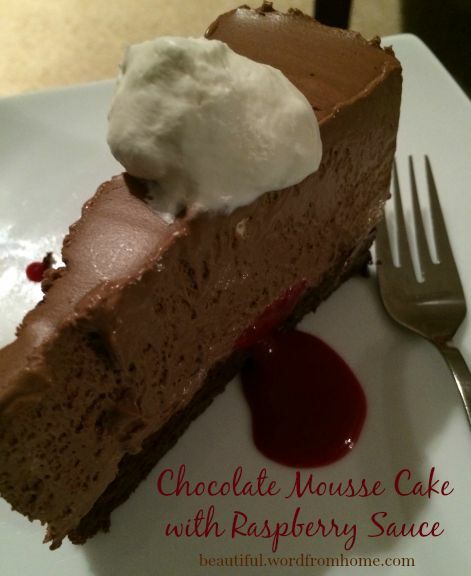 With a hint of raspberry coulis on the side -- you know how lovely chocolate and raspberry go together -- it was m-m-m good. Earlier this summer, we had the very happy privilege to gather with loved ones to celebrate my dear mom's 80th's birthday. My dear niece made and decorated this exquisite cake ... moist white vanilla cake layered with chocolate ganache ... it was a cake most elegant for celebrating such a grand birthday. Along with the cake, my niece made these toothsome cupcakes. Of course, I had to try one of those too, but I did have the 'wisdom' to wait until the next day. A little dessert seems too little, but we all know what we feel like when it's too much -- I didn't want to spoil the effect. We end our collection of five with this summer favourite, for who doesn't love a dessert of fresh rhubarb, oatmeal, sugar and cinnamon (with just a hint of clove) ... hot from the oven on a cool summer's evening. Topped with a generous dollop of vanilla ice cream, it's not fancy but it sure is homey, comforting, and sooo satisfying. I love it when the ice cream melts into the warm fruit. 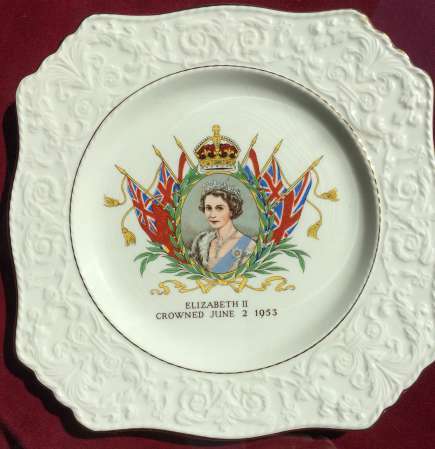 A British friend of mine was on holiday at the same time and went to the party at Government House! She was thrilled to meet the Governor and have a photo taken with her. You must have been there on the same day! Wow, I could have bumped into her and not known! Small world! What fun! Talk about tempt the taste-buds! Oh my goodness, Brenda they all look so delicious! As you say, a dessert can be anything from a homely (but gorgeous, comforting) crisp (we say crumble) to the most elegant confection. All good. Your niece did really well with that stunning cake/ gateau. Isn't it fun to savour a luscious sweet when out for the evening or on a little break?...Like you say, you have given up the guilt because you are committed to enjoying every part of the experience. made on the spur of the moment last evening: meringue nest, good quality vanilla ice cream blob, tiny bit of whipped cream and a slightly warmed sauce made from a combination of lemon curd (again, GOOD quality) bit of condensed milk, and single cream. mmm, oh yes! Alex, your sweet concoction sounds so yummy. The variety tastes and textures would make that so satisfying to the tastebuds! I enjoyed the quote almost as much as the desserts. You always find the best quotes:) thank-you for the visit and i hope you are getting your beauty sleep. I'm going to re-enjoy these desserts! Oh, I do love Murchies, but we didn't go there this trip, although I was able to buy some Murchies black tea when we visited Government House. S-I-L and I visited another lovely tea shop called Silk Road in Victoria that's where I stocked up on some tea supplies. I like visiting your state too... it's a lovely spot in our world! Everything looks delicious! I would eat and enjoy all these desserts...I'm a "sweet" girl. lol! I liked the quotes as well. 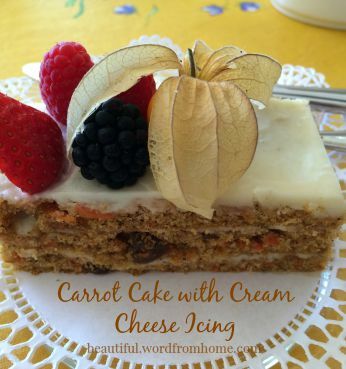 Oh my goodness, what a delightful post who would have thought a desert could look so wonderful, the carrot cake looks divine! The quotes were a wonderful touch, I really enjoyed them. Have a great weekend. Hmmmmm...I need some tea and cake! Beautiful photos and even better descriptions! I have to pick Mom's birthday cake as my favorite. But, I guess it's 'cause she and I are close to the same age and I feel a connection. And, I just like CAKE. Your desserts look fantastic, we don't eat many here. Not that we don't like them, we do, but even looking at them puts weight on me. Desserts aren't our every day affairs either, for the same reason. But this summer there seemed to a few more with holidays and special birthdays. Thanks for stopping by. All of a sudden I am feeling VERY Hungry - and a salad just isn't going to cut it!! 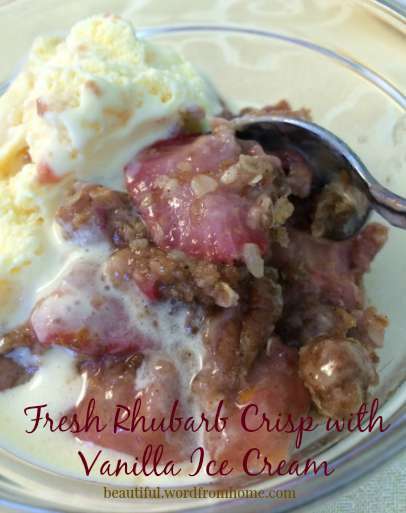 That rhubarb crisp looks amazing! I still have a bag of rhubarb in my freezer from the spring- It may become crisp before the day is done! Thanks for the inspiration!! Glad we can't gain weight from looking. Your trip to Victoria sounds so wonderful and elegant. Brenda, I've so enjoyed my visit to your little corner of blogland today. Dessert was delicious, and the video on your sidebar (Perfect Day) was scrumptious too. LOVE, LOVE, LOVE the quote by Susan Brunch, "GO BE LOVE..." ...sigh. Hahaha ... my eyes translated, I didn't even notice. not fun to see so many desserts with sugar than a diabetic can't eat....lol! Oh lovely deliciousness! Here I live in Victoria and I didn't know there was a restaurant at Government House although I've wandered through the gardens many times. How great for you to be there on the big day of celebration! 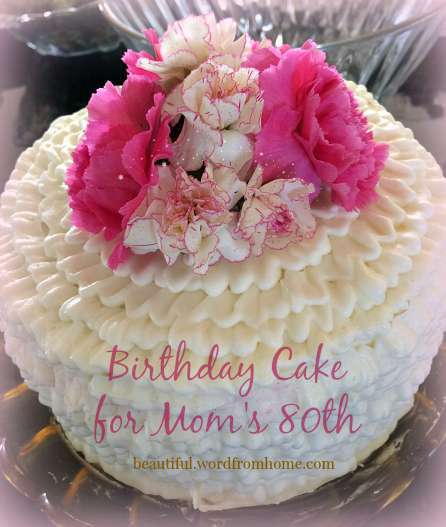 The cake made for your mom's 80th is a beautiful confection. I'm off to make some apple desserts! 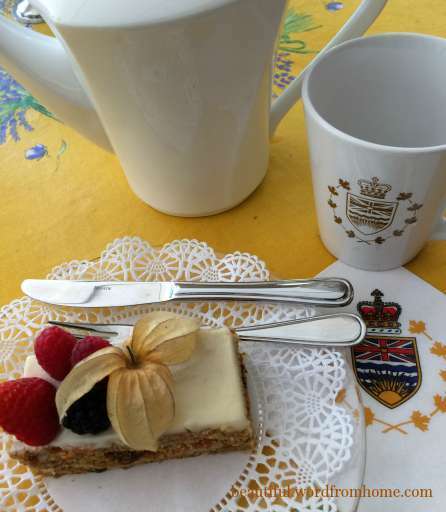 You enjoyed some decadent desserts this summer Brenda and it would have been exciting to see the celebration at Government House for Queen Elizabeth's milestone. Your mom's 80th birthday cake looks delicious, a nice job on the frilly icing. 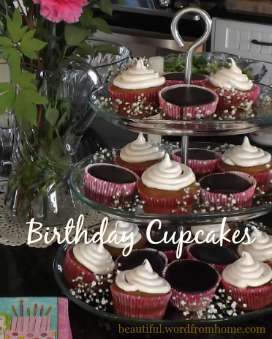 They're all beautiful and sound delicious, but the one that most calls my name is the carrot cake with cream cheese icing. Yum! I love deserts that are not only delicious but leave you with a memory or a story. Now that is a fine way to remember a season--by the fabulous desserts you enjoyed! And I'm so happy you included the Lora Brody quote. You have some talented bakers in your own family too. I loved these pictures and the quotes, and do so appreciate that you stopped by my blog. Oh, my! What delectable temptations!